Unlike lugging around one of those bulky car camping chairs, backpacking chairs can be easily stashed in a stuff sack and not make a huge fuss when latched onto your pack. While ultralight purists may tell you you don’t need one on the trail, at the end of the day you’ll sure be glad you brought it. 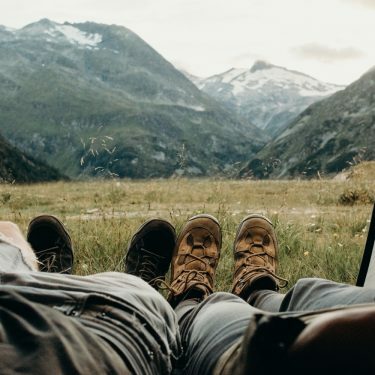 Sitting around a campfire with your buddies or kicking off your hiking boots to let your weary feet breathe is that much better with a comfy seat under your backside. Matched with light weight, this is a luxury item you can afford. If you’re looking to enjoy the trek and the downtime too, then a backpacking chair is right for you. 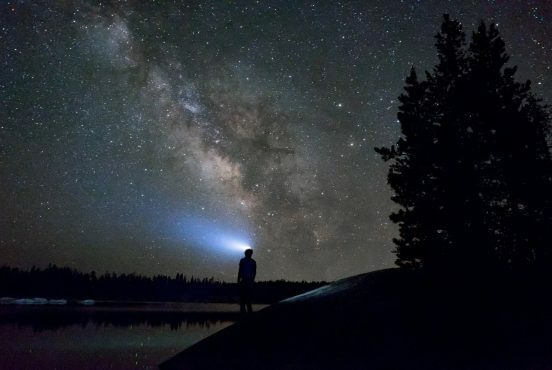 We gathered up five of our personal favorites we like to take on our overnight ventures. Whether you’re looking for the lightest chair around or the most comfortable support for your back, you’ll find it here. Ultra-lite and durable is the name of the game when it comes to the Helinox Chair Zero. In fact, in 2017 it even won Backpacker Magazine’s Editors’ Choice Awards. This backpacking chair is a winner because it’s the lightest seat around at a mere 16 ounces. It’s also the definition of tough. The single-shock cord pole frame is made from specially designed anodized DAC aluminum poles. Meanwhile, the ripstop polyester seat proves its own strength. Together, the duo can hold an impressive amount of weight, 265-pounds to be exact. With construction like that, there’s no doubt this chair can take a beating on the trail and still live up to its performance expectations. While it’s not exactly cheap, it’s durable construction, packability, and astounding weight are worth considering if you’re serious about putting in long miles. 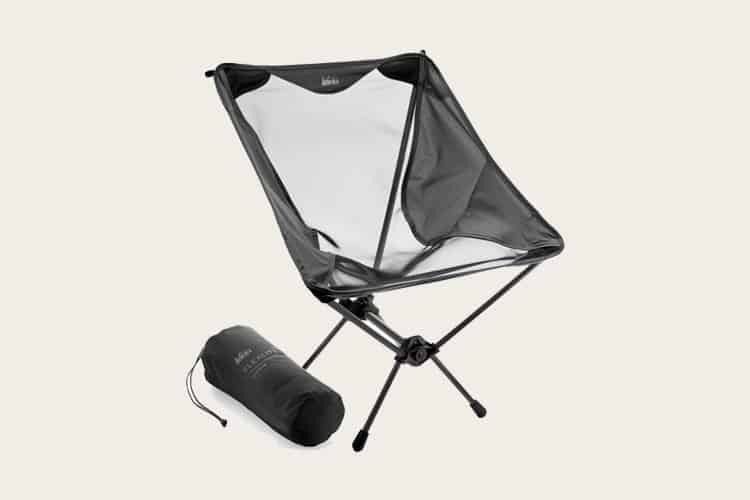 REI makes some of the most durable yet affordable backpacking chairs around. If you don’t mind a little extra weight, then take a gander at their Flexlite Chair. This deep-seated chair offers plenty of support for your bum along with a relaxing recline. This is a much appreciated feature as you’ll find the competition tends to skimp on this attribute to save a few ounces. 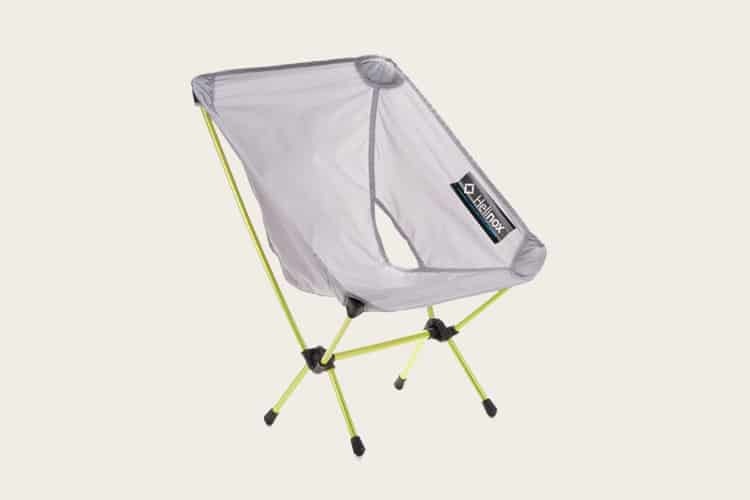 It has a surprising amount of mesh ventilation for staying cool and a sturdy 4-leg aluminum frame for stability. Bonus points for the side mesh pocket to keep smaller items from getting lost in the dirt. Weighing in at 28 ounces, it is the heaviest chair on the list. However, those extra ounces turn this chair into one of the most comfortable backpacking chairs on the market. If you really value maximizing comfort at camp with less regard for trail weight, this might be the chair for you. 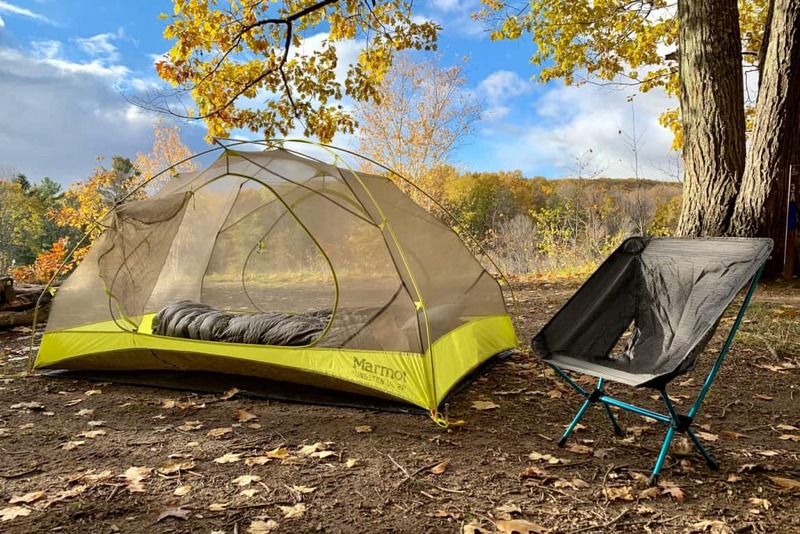 If you like where the original REI Co-Op Flexlite is headed, but the down to earth approach is more your speed, then you’ll feel at home in the Flexilite Low Chair. Like the Flexlite, this chair has a similar construction with some noticeable modifications. The first one being the seat height. A whole 2-inches lower than the original, this chair allows you to stretch out your legs so you can take the weight off. While some backpacking chairs require balance, this one keeps your center of gravity low in its deep seat allowing you to fully rest your body. 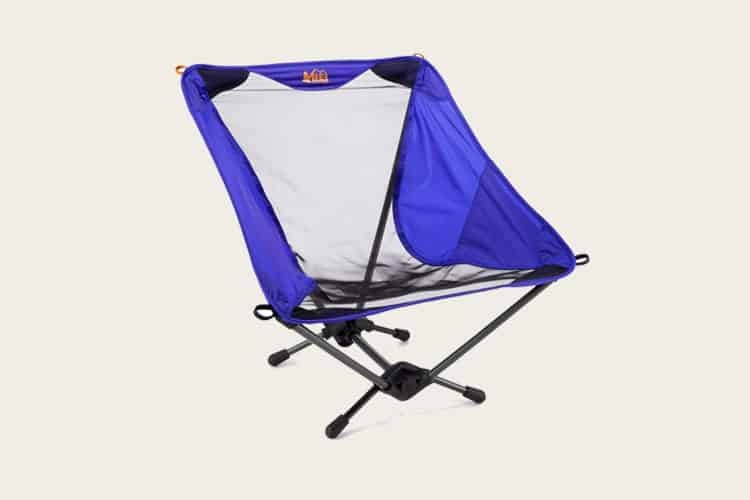 Slightly lighter at 25 ounces, it has a ripstop nylon mesh seat and an aluminum frame capable of supporting up to 250-pounds. If you’re really looking to kick back and take a load off when you reach camp, then this chair is it. 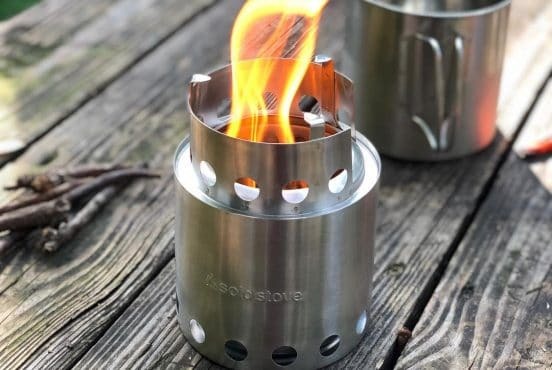 Alite is run by a small creative team dedicated to transforming the everyday camping essentials into easy-to-use gear with an attractive design. You can catch their latest design every spring when they launch their new line. 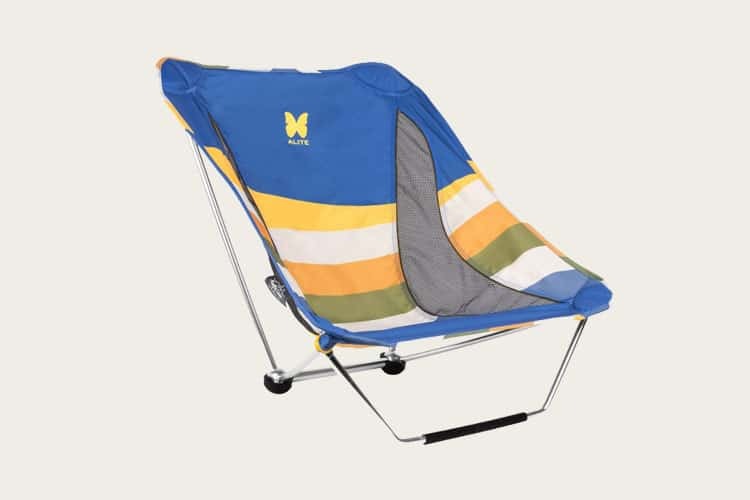 Their Mayfly Chair has caught our eye and not just because of the fun pattern, but its unique frame construction — this backpacking chair gives you the option of rocking. To rock, simply fold out the optional front leg and sway until your heart’s content. Feel like chilling? Kick down the leg and keep steady in place. The seat is made from lightweight ripstop nylon with a slit mesh paneling on each side. For colder nights, this will keep your back warmer while still providing ventilation when warming up around the campfire. 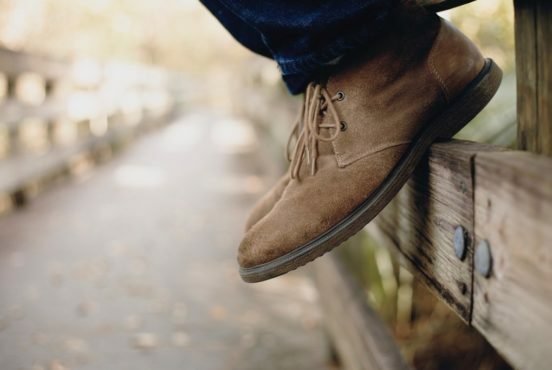 The Mayfly has exceptional back support along with a supportive seat. It sets up in a snap and packs back down into a stuff sack. It’s also available in three eye-popping designs breathing fresh life into the trail – the Southwest pattern being our favorite of course. Weighing in at 25.6 ounces, it gives you all the fancy features at a reasonable weight. For those who simply want to be elevated above ground, there’s always the option of a backpacking stool. There’s a range of options on the market, but dig the REI Co-Op Trail Stool. Minimizing weight and space, this backpacking stool is the prime choice if all you need to do is take a seat. 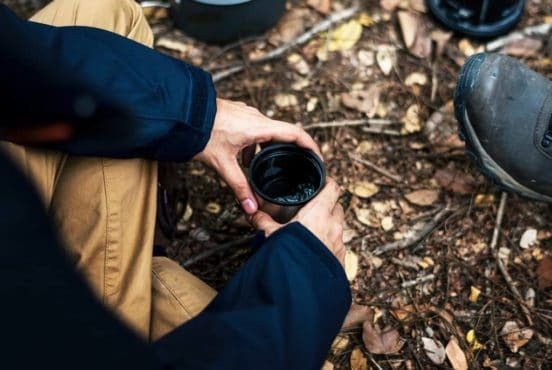 With this stool, you’ll be able to rest 15-inches off the ground so you can take a quick breather or scarf down your dehydrated meal wherever you find solid ground. We also can’t help but be drawn toward the price. We know not everyone is ready to fork over the dough for an ultra-light backpacking chair like the Helinox. This stool is a stellar alternative. 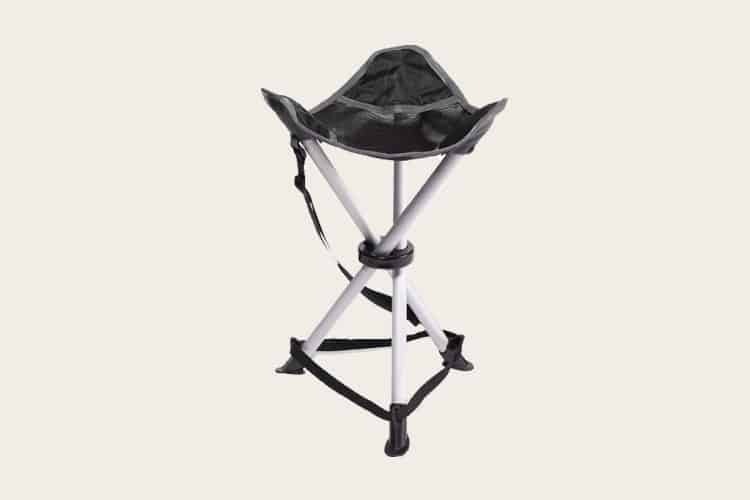 It has a sturdy aluminum tripod base with a ripstop polyester seat capable of holding up to 200-pounds. 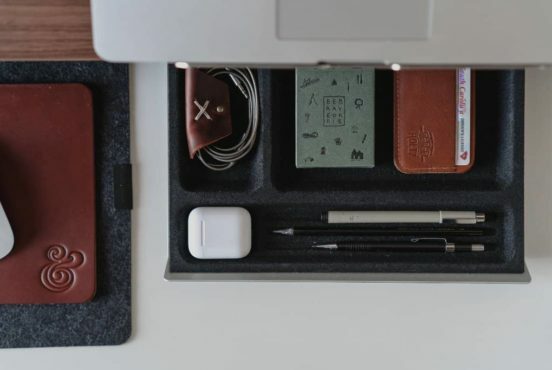 And at 1-pound 2-ounce, it packs down light enough and small enough to take on longer journeys as well as overnight ventures. For the backpacker willing to sacrifice a backrest for the sake of weight and cost, this is your ideal buy. Looking for more backpacking upgrades? 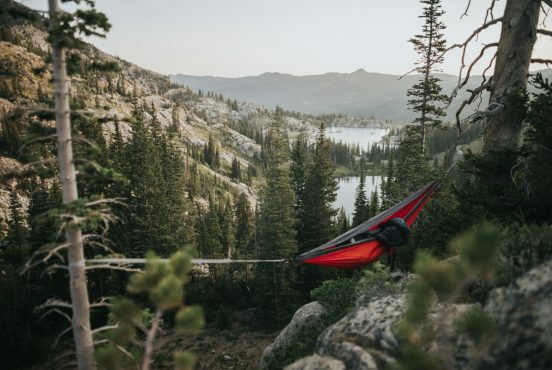 Check out our favorite hammock underquilts, backpacking pillows, camp shoes and field watches under $200. 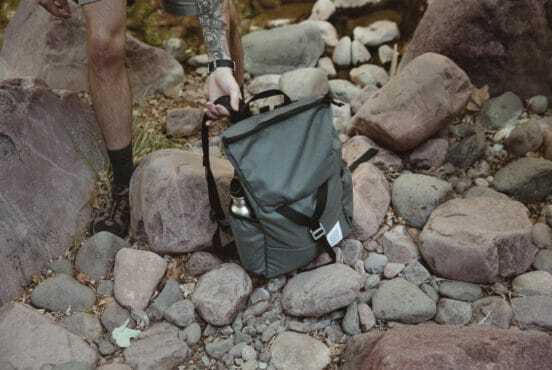 The Y-Pack is a fundamentally simple bag, but it holds up as well as Topo Designs' larger, more rugged packs. Its streamlined focus on the essentials makes it affordable and functional: an ideal combo for day trips and weekend ramblin'.